I am always on the look out to use up leftovers, they serve as healthy office lunches options for the next day. I am trying to slowly move away from the lure of white rice and incorporate more of brown rice and other grains. The new year saw me stocking up on pearl barley, buck wheat, farro and chia seeds. These happen to be ingredients I have always had at eateries, they have not been a part of my pantry. So here’s to being hopeful that I use them up this year. Sharing the recipe for a simple salad made with leftover brown rice. In a mixing bowl, add all the vegetables and rice. Toss them together. Juice 2 lemons, add sumac powder, dried herbs, salt, olive oil and whisk it together. Pour this vinaigrette over the rice mixture and toss it well. Garnish the almonds and mint over the salad. Refrigerate for half an hour or more and relish the salad. Until next time, keep it healthy and happy cooking! 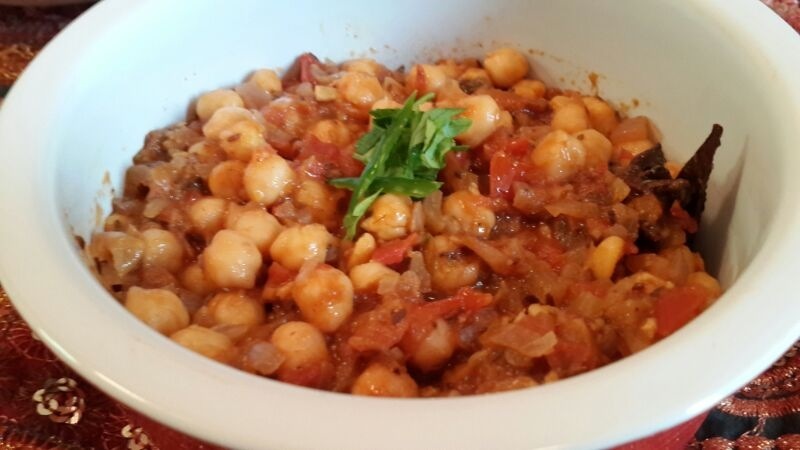 I discussed following a high protein diet for the last few weeks and in continuation to the same I decided to blog about this Spicy & Tangy Chickpeas recipe. Again this is a quick dish I make for office lunches with chapattis. It comes together quickly in 15 minutes and sees me out of the door with a brown bag in hand. Living in Dubai, opting for take aways and ordering in food regularly at work is often the easy way out. But even if you spend a minimum of AED 20 on lunch everyday, the amount can dig up a hole in your pockets by month end. I rather treat myself to a new cookbook or a massage from the money saved by carrying lunch. It’s a habit I try to keep at and constantly look of recipes which do not see me in kitchen for long on work day mornings. In this recipe, I have substituted the chaat masala with sumac powder and I can say that I am not going back. This was a good call. Sumac is a popular spice used in Middle Eastern cooking. A few spices which I discovered after coming to Dubai and which fascinated me were Zaatar, Sumac and Dried Loomi powder while strolling in the spice souks of Global Village and Union Co-op shelves. Sumac is a good source of Vitamin C, Omega 3 fatty acids and is an antioxidant. It has a very subtle lemony and tart flavour and I love sprinkling it to on my salads, hummus and chaats. In a wok, heat oil and add cumin seeds. Once they sizzle, add green chillies and ginger garlic paste. Let it cook for a minute and add onions. Add tomatoes once onions have browned. Cook tomatoes with the dry spices until they leave a ring of oil on the sides of the wok. 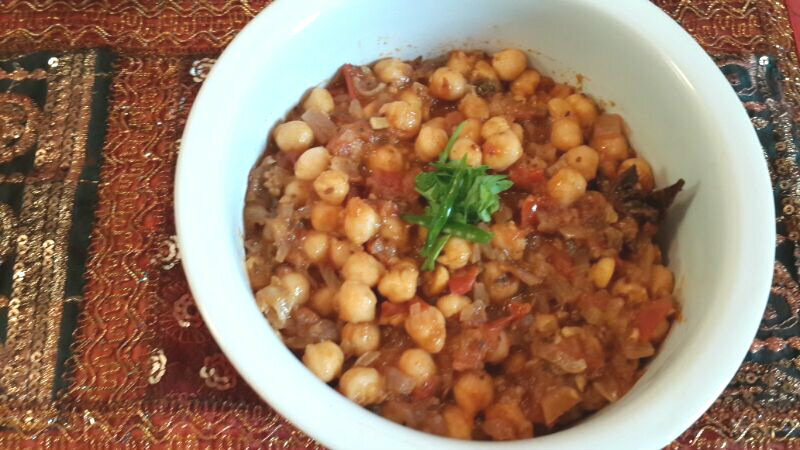 Add salt to taste and drained and rinsed chickpeas and sauté them with the mixture well. Cook for a few minutes, take off heat and garnish some freshly chopped coriander leaves and slit green chillies. Until next time let me know you quick fix recipes!